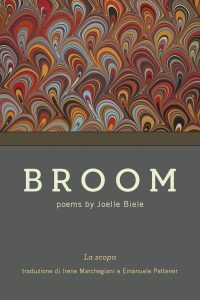 Joelle Biele’s Broom, recipient of the 2013 Bordighera Poetry Prize, studies life with such microscopic precision and attention that the daily cracks open as wondrous, perplexing, and miraculous. The poems, printed in English and translated into Italian on the mirrored page, gave me new eyes, new occasions to see, and lenses with which to reflect on the life I bring with me to the page. Devoid of sentimentality, these poems inquire into the webbed experiences of navigation—navigating motherhood and writing and traveling and illness and remission and the natural world. Biele’s rich imagery, diction devoid of sentimentality, her ability to revel in form (from sonnets to the ghazal, to a sestina so well executed I only caught it on the second read), and the intimacy she evokes in the epistolary poems to her children, make her a poet to celebrate in all languages. This is a collection to read and reread, carry with you, and carry out into the world. Biele gets at the universes contained within the complexity of motherhood; from the deep blood-love of our children, the bearing witness to their complex humanity and coming to know the world, the acquisition of coordination and language, and the truth we carry as parents regarding our fragile bodies and fragile world. Biele captures the braided joy and suffering, deep knowing and teetering uncertainty, places where we are rooted and those we explore. Biele, whether it is the three sections of sublime poetry, or her sculpted nonfiction, offers us a microscope to climb through. She’ll show us the worlds within our own world, remind us that every day transformation is occurring, life is exploding and perhaps receding too—and it’s all poetry. 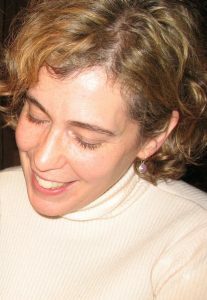 Barbara Harroun is an Assistant Professor at Western Illinois University. Her most recent work is forthcoming or appearing in Fiction Southeast, Watershed Review, Rappahannock Review and Iron Horse Literary Review. Her favorite creative endeavors are her awesome kids, Annaleigh and Jack. When she isn’t writing, reading, or teaching, she can be found walking her beloved dog, Banjo, or engaging in literacy activism and radical optimism. She can be found at barbaraharroun.com.